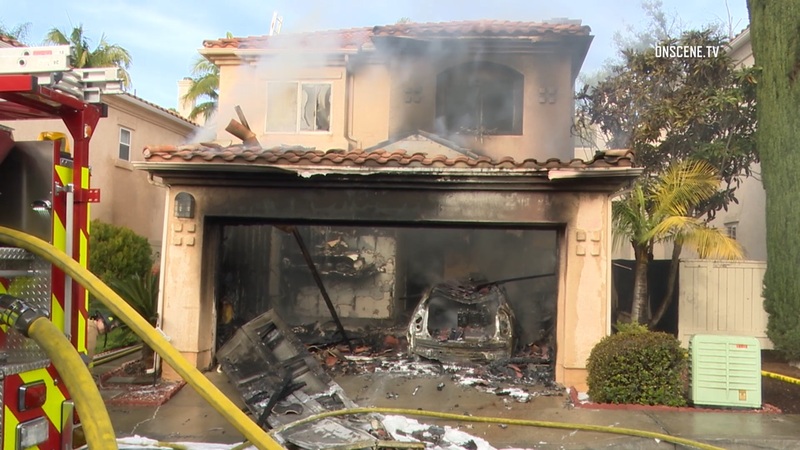 A fire that started in a garage badly damaged a home in Scripps Ranch Sunday morning, a fire official said. Crews first responded at 9:16 a.m. to the blaze in the 10800 block of Caminito Alto, in a neighborhood off Pomerado and Spring Canyon roads, San Diego Fire-Rescue Battalion Chief Rick Ballard said. When firefighters arrived, they found smoke and fire coming from the garage of the home, Ballard said. It spread to the home’s living area and an adjacent residence before crews were able to get a handle on it. Firefighters and investigators stayed at the scene until about 2 p.m. The home’s three adult residents and their pet tortoise were uninjured, although they were displaced by the fire, Ballard said. The damage to the adjacent home wasn’t serious — just some singed Stucco, according to Ballard — and the occupants of that home weren’t affected. The blaze dealt about $250,000 of damage to the structure and $150,000 to contents, Ballard said. Updated Jan. 20, 2019 at 3:56 p.m.